Media Kids is an exciting and stimulating media incursion program for grade one and two students. 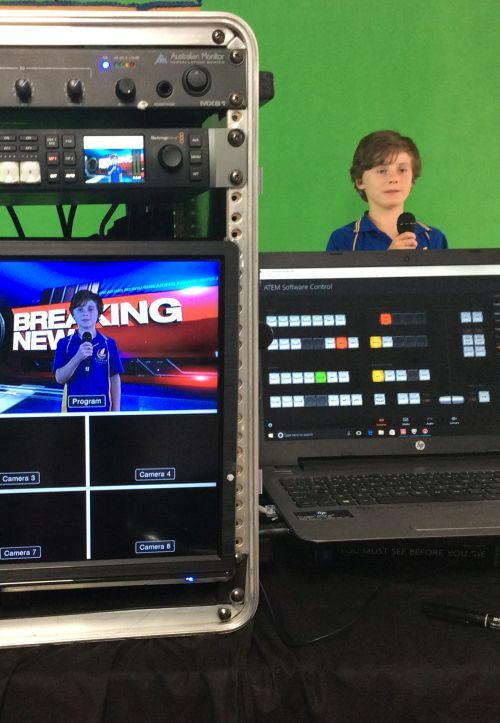 Every child will have at least 2-3 roles in a green screen TV show and radio show. “Green Screen Studio TV Show” Each child will have the chance to appear 2-3 times on the show. The children will present news items, sport, weather, advertisements, singing, dance and an interview with their teacher. The students will be able to watch live on TV the backgrounds being superimposed. Each class will receive a DVD of their TV Show. “Sounds Fun to Me”All students will participate in a series of audio activities including a listening activity, an interview, a sound story, a mock radio show, talkback radio, etc. A portable studio will be set-up with two microphones. A recording of the audio activities will be left for each class to listen to. The teachers will run this activity.